Had an excellent turnout. The big deal of the day was Dave Miller and Roger Freeman extracting the broken stud in the #1 cylinder head on the Canuck’s OX-5. The repair was actually completed and the engine restarted – though it ran rough unless half-choke was held. I spoke with Roger again today and they have fixed that issue (too little fuel making the engine run lean) and fine-tuning of the Canuck continues. Roger hopes to test fly the airplane later this week after some more ground running. 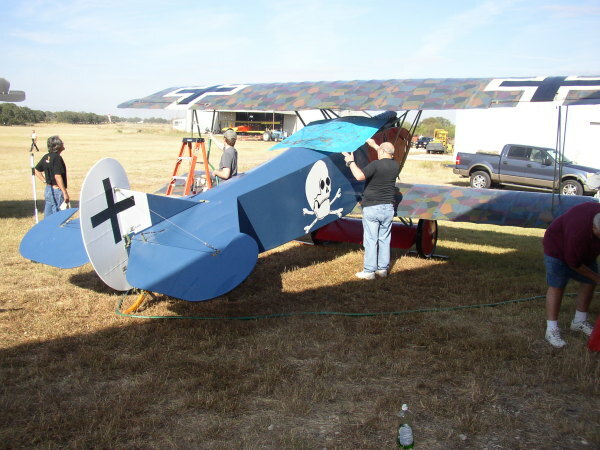 Many airplanes were cleaned up for the event – Jeff Basham, Chili Ornelas, Don Larson, Sanford and maybe a few others washed the Fokker D.VII, the Triplane, the Cub and the Bleriot. With Terry’s help on the forklift, the hanger boxes were moved and the airplanes rearranged so they all fit into the hanger and can easily be removed. Previously the D.VII had to be manhandled into a pirouette and backed out! No More. 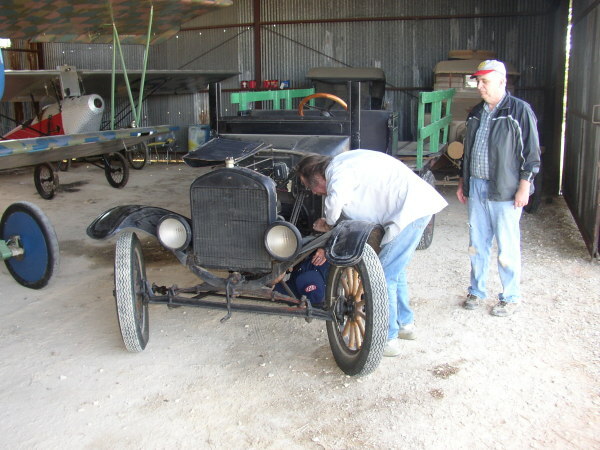 Sanford and Don finished the D.VII’s nose bowl and Jeff Basham assisted in getting the airplane back together. It looks much more presentable, though not quite together. Terry spent some time weed whacking, and a lot of time on the forklift rearranging piles of metal belonging to various disassembled hangers into more orderly piles on the museum slab. At least that is what I think he was doing! Team Vehicles, that is whoever is working on vehicles on a workday, started addressing some chronic starter switch issues on the Model TT. Doug H was doing some comparative starter research and opened the bonnet on the Signal Corps truck--and was greeted with another snake, smaller than the original but a real biter. Tom Gaylord played crocodile hunter and began to poke and prod, finally coaxing the critter to hang onto the bottom suspension where I was able to make use of the incorrect Indian clutch lever imported from Australia--how appropriate. Anyways I was able to get em on the ground, and crikey, Tom picked it up! Well he used the clutch lever. He picked it up and took it out to the oak tree where I assume it will grow up and eat rats. It wasn't a big snake, not half the size of the original snake. I nominate Tom G as our resident snake handler from now on. Some servicing was done on the TT to get it ready for the airfair. It will probably be used to assist in the souvenir area. Back to the TT, I DID approve of the TT repair, not that my approval had anything to do with anything. Lynn and Doug H took care of the problem and sent me off parts hustling to Luling were I bought what is hopefully a heavier duty switch. Lynn has also made some very nice new floorboards for the TT. We went out back to the old car graveyard and checked out some tops to get some ideas for making a top for the TT. The TT is a good runner, hopefully we have gotten it a tad more reliable...we will see. After the truck work was finished, Doug went over to the Dr.I and commenced the great job of engine cleaning on the Dr.I. The Dr.I looks really nice as does the PFM D.VII that looks like it is ready to fly. There has been some rearranging in the old hanger and the D.VII is going to be better displayed and now has an engine, prop and cowling fitted. Looks like a fighter now. It was washed by the guys and will look great on the flightline on Saturday. Sanford and Ron worked on the Indian, and have it lookin' good. It will still be on display only, but I am very hopeful it will be running by AirFair 2009 now that it has the new tanks.